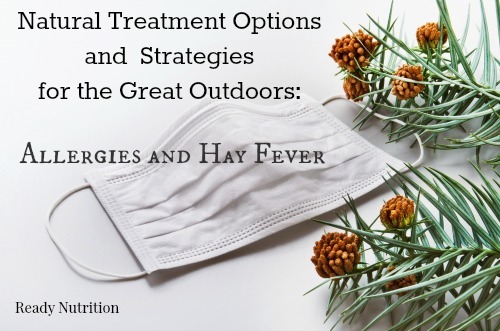 To plan your outdoor activities efficiently, you need to factor in the possibility of allergies or hay fever getting in the way of your plan. If you’re susceptible to them, keep these natural treatment options in mind. Remember: An ounce of prevention is worth a pound of cure. Hey there, Ready Nutrition Readers who are planning on backpacking, hiking, camping, or other outdoor activities! This article is for you or any family members who may have problems with either allergies or hay fever. I have outlined a bunch of information for you pertaining to the conditions, as well as outlining a few natural remedies and aids you may wish to explore to help you enjoy your outdoor adventures. I hope that you will take this information and use it to plan your trip and gather any supplies you will need to make things a little easier on you. Histamine reactions are a major part of type I hypersensitivity reactions, including asthma attacks. Hypersensitivity is defined as an abnormal sensitivity to a stimulus of any kind. Such abnormal sensitivities are bounded by antigens, defined as a protein or oligosaccharide marker on the surface of cells that identifies the cell as self or non-self; the type of cell is identified; the antigens then stimulate the production of antibodies by B-lymphocytes that will neutralize or destroy the cell if necessary; they stimulate cytotoxic responses. The histamine response is akin to a jigsaw puzzle in terms of illustration of function, albeit an oversimplification. With an allergic reaction, the offending particle that causes it binds to a tissue receptor site. This site is the source of the production of the process regarding immunoglobulin. The resultant irritation on the skin stems from histamine production and the irritation of the affected tissue. There are drugs that block these receptor-sites involved in producing histamine (basically the substance triggering the allergic response); these sites are known as H-1 (histamine) receptors. The allergen (offending irritant) triggers the histamine production. What the medications do is function as a tailor-made jigsaw puzzle piece. They “fit” into the receptor site and block the production of histamine, thereby either preventing or minimizing the allergic response, and thus eliminating or lessening the hives. Such drugs are known as antihistamines. The greatest rule to follow is to avoid any known allergens and particles that cause such problems. One common medication that lowers the allergic reaction is Benadryl (diphenhydramine HCl); it functions by blocking the production of histamine as outlined. Benadryl is available over-the-counter, and it is useful in many applications, such as bee stings and insect bites to severe allergic reactions. There are some natural ways to relieve the symptoms of these types of allergies. Read more here. Autoantigens are antigens on the body’s own cells, and foreign antigens are antigens on all other cells. Over one-fifth of all Americans suffer at one time or another from an allergic reaction of some kind. Allergies are defined as an immune response to a foreign antigen that results in inflammation and organ dysfunction. These allergies can range from simple nuisances to life threatening emergencies. The most severe allergic reactions usually occur with stings from bees/wasps/hornets, penicillin product allergic reactions, radiological contact media reactions, and latex allergy sensitivities. The immune system of the human body works in the following manner: 1) identification of the offending organism (pathogens), and 2) repelling the invasion with defensins. When first contact with the allergen is made, the body’s immune system becomes “sensitized,” meaning it is initially activated by any foreign body holding “alien” antigens as outlined before. I highly recommend picking up a bee sting first aid kit for you or any member of your family who is allergic to bee or hornet stings. Subsequent exposures or contacts then result in the full-blown allergic reaction and the binding of specific immunoglobulins (especially IgE) or the initiation of immune cells (including the mast cells, the basophils, and/or the T-cells). All of these just mentioned are capable of releasing inflammatory chemicals, such as histamines, kinins, leukotrienes, and interleukins. These inflammatory chemicals act on a local or a systemic level depending on the size and severity of the offending foreign antigen presence. With the chemical release, the allergic symptoms are created, and these are as follows: nasal inflammation, production of mucous, watering eyes, itching, edema, rashes/patches, bronchospasm, stridor (a high-pitched grating sound heard when breathing occurs), and one or more progressing to shock. The diagnosis needs a history of exposure and reactions. Tests are conducted when the allergen is not obvious or apparent. A skin-prick test can be conducted using specific allergens and then monitoring for a reaction. Other tests can take the form of intradermal injections, blood tests, and bronchial provocation tests, all of which are fairly self-explanatory. Only a physician with a laboratory on hand can accurately determine the exact allergen and prescribe appropriate treatment. Some treatment procedures are as follows: avoiding the allergen(s), antihistamine therapy, cromolyn, corticosteroid administration, and epinephrine. For chronic management, injectable epinephrine can be provided for emergency outpatient first aid to treat for anaphylactic shock. In cases such as this, the patient is counseled along with his/her family members what to do in an allergic emergency involving possible anaphylactic shock. Devil’s Claw (Harpagophytum procumbens) is an anti-inflammatory and analgesic. The dried root is used with allergies and fevers. It comes in capsule, tablet, liquid, and whole herb form and can be found in your finer health-food concerns. An infusion is made with 1 tsp = 4.5g drug, with 300 ml of boiling water; steep for 8 hours, then drain. A daily dosage of 1.5 – 4.5 g, no more than 3 times per day may be taken. For external use, 1 dessertspoon of tincture can be diluted in 250 ml of water for washes and poultices. Feverfew (Tanacetum parthenium) is an anti-spasmodic and anti-inflammatory. This herb is useful in bronchospasms that occur in asthma attacks. The herb is contraindicated with pregnant women and children under 2 years old. Drug interactions can occur with those prescribed for anticoagulants, antiplatelet medications, heparins, and non steroidal anti-inflammatory drugs. The dosage is 1-3 leaves (approximately 25-75 mg drug) 1-2 times per day in a tea or infusion. Standard parthenolide content in packaged capsules or extracts should not exceed 0.2% as printed on the label. Finally, Thyme (Thymus vulgaris) is excellent for use as a bronchial antispasmodic and an expectorant. A tea can be prepared with 1.5 – 2 g drug in boiling water, steep for 10 minutes, and strain. 1 tsp = 1.4 g drug, and 1-2 g per cup can be taken 2-3 times daily. Extracts such as tinctures are commonly found in your local health food store and taken either as a tea or in cold water. Follow the package instructions of the manufacturer for preparation and dosage. Hay Fever can provoke allergic reactions but is different from allergies. Hay Fever is defined as a seasonal illness marked by sneezing, sniffling, runny nose, and itchy or watery eyes, occurring in approximately 10-20% of the U.S. population; the malady is a Type I hypersensitivity reaction. The body systems involved are the mucous membranes of the nose and the upper air passages. Hay Fever is the most common manifestation of an inherited, or atopic allergy. The affliction is also known as allergic rhinitis or pollinosis. The malady finds its most common forms of transmission in airborne pollens, common dust, spores (produced by funguses), dust from hay and straw, and dust mites (a common household pest almost impossible to see with the naked eye). Pollen itself is worth mentioning here, simply because most people hear the word but are really not aware of what it is. Pollen grains are the microspores of flora that constitute (with further development) the male gametes of plants. These grains are transferred by wind, by insects (bees and butterflies, for example), from one plant to another for reproduction. Many of the airborne pollens (the ones that simply drift with the wind) are allergens. 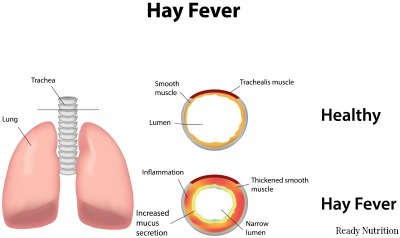 In the springtime, the most common forms of pollen causing hay fever originate with trees. In the fall, the pollen is produced from wildflowers; one example is ragweed. One of the problems with hay fever is to determine the exact causative agent (a particular type of pollen or dust, for example); this can usually only be solved by a lab and tests. Treatment involves the prescription and use of seasonal antihistamines, cromolyn, and corticosteroids in the form of nasal sprays. Also helpful are HEPA (high-efficiency particulate air) facemasks. As mentioned earlier, the true test is to be able to identify the causative agent for the sufferer. The naturopathic aids mentioned here are by no means exhaustive; however, they are mostly symptomatic aids in nature to help with the excess mucous and irritation suffering with the exposure. Luffa (Luffa aegyptica) is an herb that may help with sinusitis and chronic bronchitis. It can be found in your finer health food concerns in capsule, tea, or extract form. Luffa has no unpleasant side effects or drug interactions. Follow the packaging instructions provided by the manufacturer regarding dosages. The herb will alleviate inflammation and the raw chafing that occurs when the sinuses become dried out. Sorrel (Rumex acetosa) is used in the form of fresh leaves or as a whole herb. Caution must be taken when consuming large quantities due to the possibility of oxylate poisoning. The herb is a diuretic that stimulates secretion of mucous. It is extremely effective with acute and chronic inflammation of the nasal passages and the respiratory tract. Commercial preparations are also available in health food stores in tablet and tincture form. Daily dosage is 2 tablets 3 times per day. With a tincture, you may take 50 drops (standardized in a 19% ethanol base) up to 3 times per day. Again, follow the instructions as per the manufacturer. Lastly you may consider Yellow Dock (Rumex crispus), an herb that can be used to treat acute and chronic inflammation of nasal passages and the respiratory tract. Yellow Dock holds no unpleasant side effects. It is available in capsule form (usually 500 mg) and as a liquid extract, commonly found in health food stores. To plan your hiking and camping trip efficiently, you need to factor these things into consideration if you’re susceptible to them. An ounce of prevention is worth a pound of cure. You have a great day, Readers! Take care of yourselves and each other, and may your adventure be both safe and enjoyable! Great article. I have respiratory challenges in the Outdoors. This will help immensely. I just bought my first feverfew plant to grow. Now I have an additional reason for it. I already use Thyme which I also add fireweed honey to since it also helps with the respiratory part. Thanks so much for this.